As your personal roving field reporter, and benefactor to the smokey community at large, I was off and about the weekend last, doing thy bidding for the betterment of BBQ, and my own good mood in general. It was brought to my attention by one of our finest subscribers, Bill, at Three Dogs BBQ, that a rather unique BBQ competition was being held not far from PotP headquarters. It was so unique, in point of fact, that I just had to go check it out. You see, The Fire on Ice Competition was in its third year, and claimed to be doing so in true Minnesota fashion – out on a wind-swept, frozen-over, 207 square mile lake just east and trifle south of no where. The last time they did this, it was rumored to be 30 below there, not including the wind chill. And now this year, they’ve cast common logic aside, and seem to be back for more. A hardy lot these cats, I thought, as I sipped my morning brew. Why not. Could be fun! So I hired a driver, also known as, Elder Brother, and we were off for the northern muskegs, trucking up the highway at semi-appropriate speeds, with bountiful apple fritters in hand, until we reached the frozen flanks of one, Millacs Lake. The ice was about three feet thick still, here at Minnesota’s second largest inland lake. 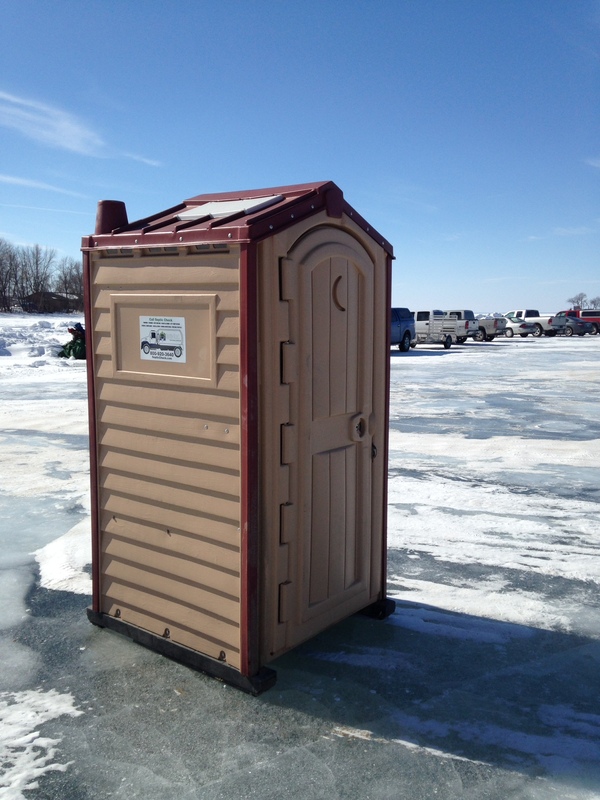 Which is a good thing for ice fishermen and pit masters alike. 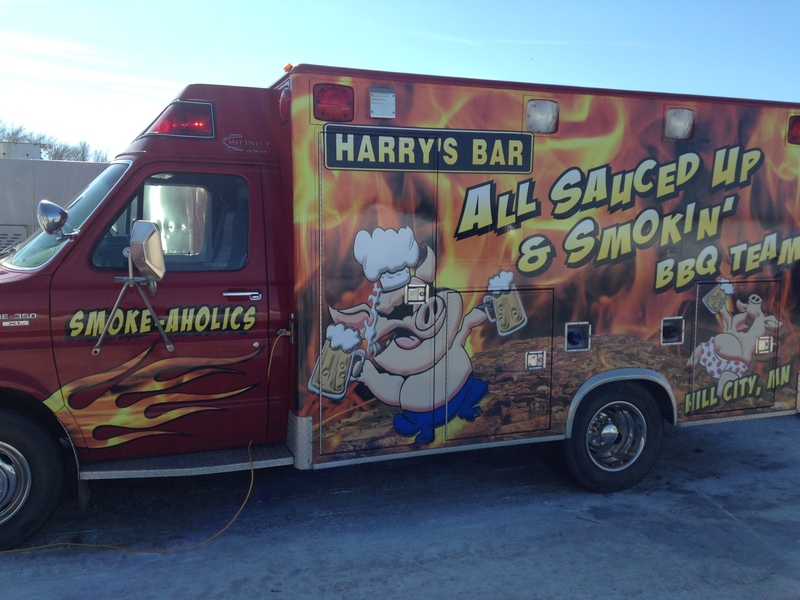 Not to mention the trucks zipping to and fro the scattered ice shanties and the Appledoorn Resort, who once again, has graciously hosted this slightly crazed, but favorable BBQ event. And an event it truly is, in every sense of the word. 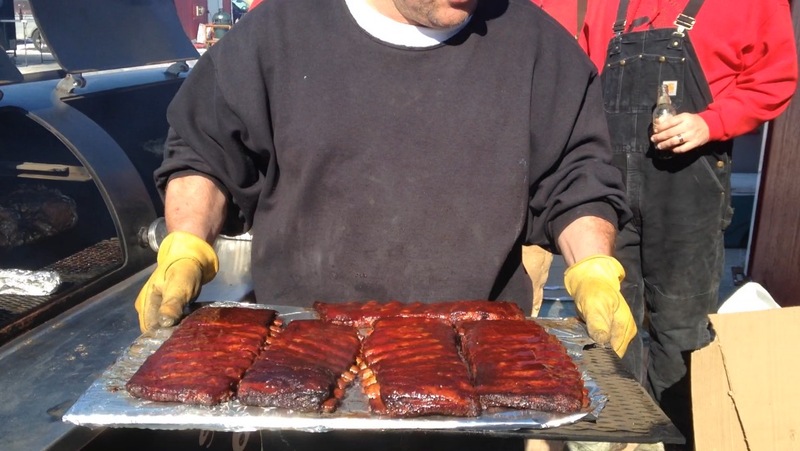 Over 50 teams were competing this weekend on the ice, in categories ranging from ribs and butts to chicken and beef tri-tip. The number of entries steadily increasing over the last 3 years. Teams from as far as the plains of Texas even, have made the polar pilgrimage for but to smoke their pork over the ice fields of Mille Lacs. It is probably the only BBQ competition in the world where you can pull a 14 inch walleye up through a hole in the ice right next to your smoker. Say what you will, but this is living! Shuffling like two pregnant penguins over the glazed ice, elder brother and I took a pedestrian tour of BBQ Alley. What they do is line up various ice houses and fish shanties to fashion a “main street” if you will. Affectionately referred to as BBQ Alley. And to each fish house you will find a designated smoker or two, or three, along with a band of cheerful folks milling about there, usually with a manly beverage in hand, musing at length over such lofty things as fire and ice. They seemed a happy lot indeed, despite the winter climes. And I could see why. What a glorious stroll it is, I must say, with boots shuffling over thick, crystalline ice, that which shimmers like diamond booty at the terminus kiss of a sunbeam’s golden slant. And the blue-tinted pillars of smoke, patron to good BBQ, curling serenely into a beautiful, blue, Minnesota sky. And the aromas people. Mercy! Every twenty feet your nasal orifices would spread again, as receptors to an aromatic parade of perfectly executed pork. 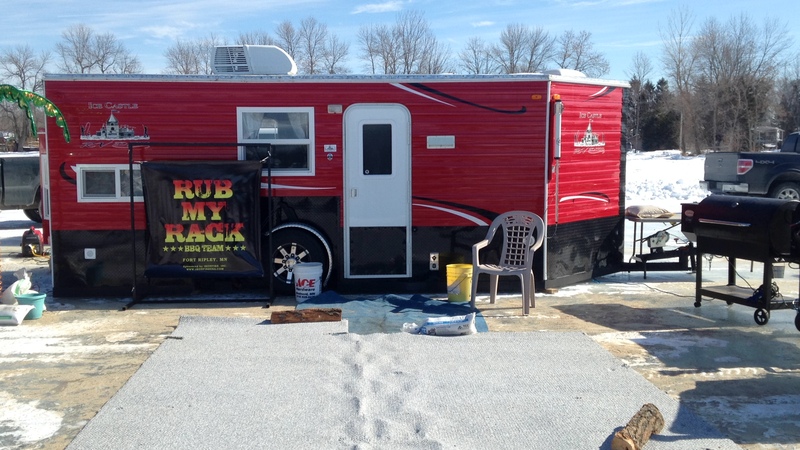 Here are just a few of the cool pits and pit keepers we came across in our time at the Fire On Ice Competition. Some contestants had it all. Even brought their own ambulance, they did. I talked to the owner of this rig, and he just shrugged his shoulders. “Had to do it!” he said. And he did. He also said he hopes to go full-time into the competitive BBQ circuit. “Can you really do that?” I croaked. “Well, I’m sure gonna try“, he said. “I just love it“. And I think he meant it too. Bless you good sir, and I hope you make Harry’s Bar proud. Shuffling onward, elder brother and I came upon one of my favorite rigs there. A custom-built monument to the BBQ sciences if there ever was one. Complete with its own barber chair! Shoot, I’d get a shave here! We reluctantly left the premises right around turn in time. People were zipping across the ice on their ATV’s and pick-up trucks, cradling their Styrofoam Cartons O’Plunder close to their downy bosoms, in humble attempts to outfox for a time, the wind and the cold. The contestants all piled into the Appledoorn Chalet for to warm up a bit and see how they had done, patron to the pit. Their labors, their dreams, their meat, in the hands of the judges now. And that’s when we saddled up in elder brother’s old truck, poured a spot of tea from a slender thermos, and made our way south from whence we came, content, and smelling akin of two hickory-tinted pork butts, who if only just for a couple of hours, had a very good and memorable day on the ice, where the wood smoke also rises. Amen. PS.. Let’s see you do this in Ecuador! 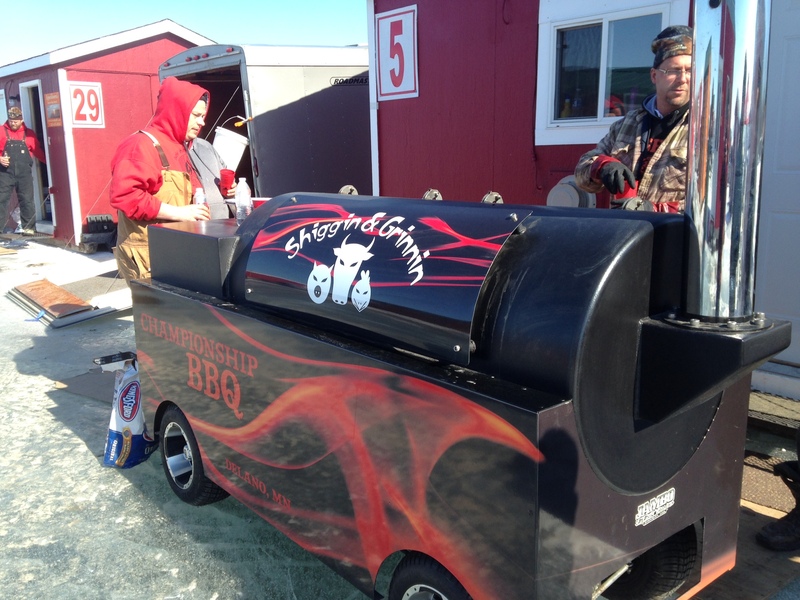 So if you’re game for a unique, cold weather BBQ competition, one of which is growing bigger every year, then check out Fire On Ice. Maybe we’ll see you out there! This entry was posted on March 1, 2015 by Patrons of the Pit. It was filed under Uncategorized and was tagged with barbecue, barbeque, bbq, cooking, Fire on Ice, food, foodie, grilling, outdoor cooking, writing. Can’t be done in Ecuador! But, it sure looked like fun. God bless you hearty Minnesotans (or as we used to call ourselves, “Twincityits”) Stay warm and eat hearty! Yeah, despite the cold, and your warm Ecuadorian blood, I do think you would have gotten a kick out of it! Certainly a unique to the area experience. Haha, many thanks. Yeah we were pressed fresh once that I know of. It’s a shooting star sort of thing. Blazing for a few days, and then a few more days after that, forgotten again. Aw well, least we eat good! great photos–what fun! But too cold for my blood. Went to a Fire & Ice event in Plymouth last year. So so cold. Thinking a bbq competition would have heated it up. The fire to the ice. You did not compete? Good point about the ice fishing–handy if you want grilled fish. Yeah they have a good time there, seems like. Hearty folk who like to have fun. No, we didn’t compete. Just checking it out. Didn’t know they had something in Plymouth too. That would be a lot closer. 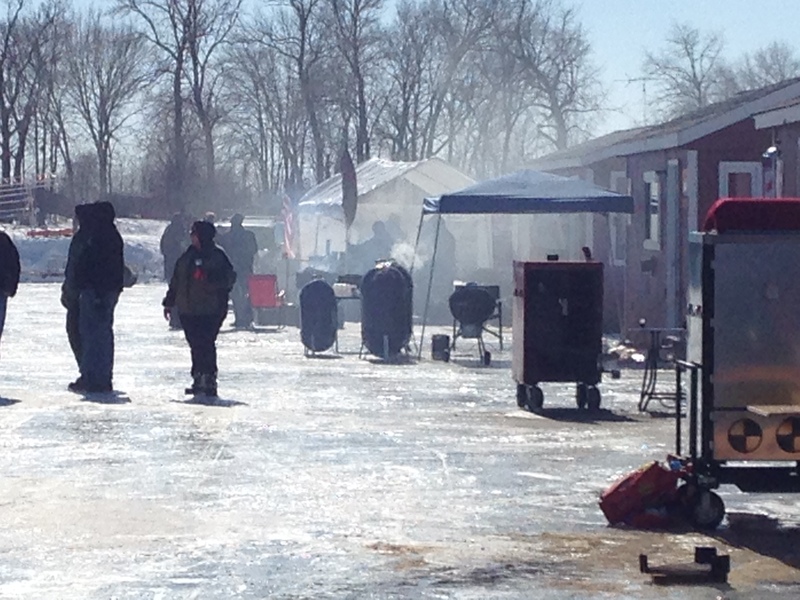 That’s some serious BBQing there PotP, solid, dependable types who don’t let minus temps get in the way of good food. Loved the Rub my Rack entrant. I saw those ribs and immediately wanted cooked meat. Hmm. Yep, they were a sporty bunch, Laurie. Slightly off the bell curve. 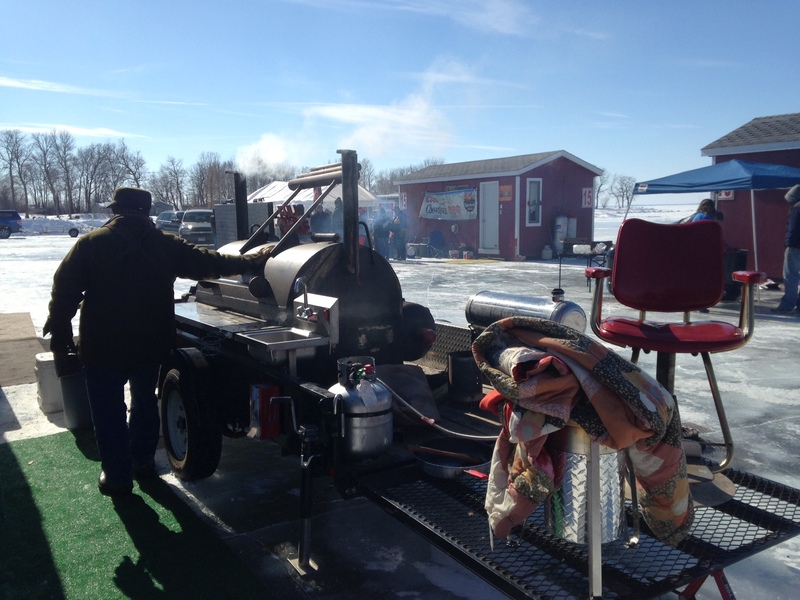 When your winter lasts for half a year, you tend to throw BBQ competitions on a frozen lake. Why fight it! The frozen lake is there, use it! Looks like it was a ton of fun PotP. But, what competition Isn’t? I just might have to venture to the Land of a Thousand lakes next winter to take it all in. By the way, you have a standing to come be a guest at any of our competitions. Just check out our schedule and let us know. Thank you kindly, Bill. Would be a privilege to partake in your curling tendrils of woodsmoke some day. I think I could get into the ambiance of such things. Yeah, the fire on ice thing looked to be good times. It wasn’t too cold either, so that helped a lot I’m sure. But it’s not like that every year. Last year for example, 30 below. Yikes. They still light the fires tho! Great review Sir! Tony and crew can throw one heck of an event!! We are from the Rub My Rack Camp. What a great weekend had by all! Haha, wow! Winter does not affect you any! Many thanks for chiming in! Cool to hear from some one who was there. What a good time on the ice.